Rekreate Fitness and Lifestyle is a premier women's Wollongong gym offering a comprehensive indoor and outdoor fitness training centre. 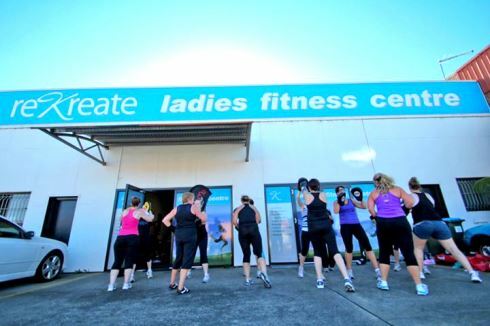 The Rekreate Fitness concept was developed specifically for women of all ages and fitness levels, our popular Wollongong group fitness workouts are constantly varied to provide you with a fun, invigorating workout. Whether you are an absolute beginner or a seasoned athlete, our workouts are tailored to suit your fitness level, ensuring you get the most out of each and every training session. Join our many success stories and come try us out! Welcome to Wollongong's premier women-only indoor and outdoor group fitness training for women. Our range of services include a fully equipped Wollongong gym environment including TRX rig, group fitness studio with over 50 classes per week, cycle studio, cardio and weights. Other services including personal training, corporate fitness programs, nutrition programs, creche services, women's social events and so much more. Come and join us in a friendly and relaxed atmosphere. Welcome to Wollongong's premier women only indoor and outdoor facility. A relaxing and friendly environment for all women to exercise. Over 50 group classes per week including Wollongong Yoga, Pilates and Zumba. Enjoy our women's only Wollongong gym environment. Fully equipped for cardio and strength. Try some High Intensity Interval Training. Burn between 400 and 600 calories per cycle class. Maximise your training with Wollongong personal training. Kreative Kids Club for your children. Get involved with Rekreate and our women's social events. Incorporate Wollongong TRX into your training. Rekreate Fitness and Lifestyle provides Real results for Real Women. We have a membership package to suit you. Rekreate Fitness Wollongong personal training packages are designed for members who wish to fast track their results and improve their performance. Rekreate Group Fitness Training is the affordable alternative to personal training wich provides you with a fun, invigorating workout. Rekreate Fitness understand the importance of having a fit & focused corporate team, the benefits are endless for the company and individual employees.